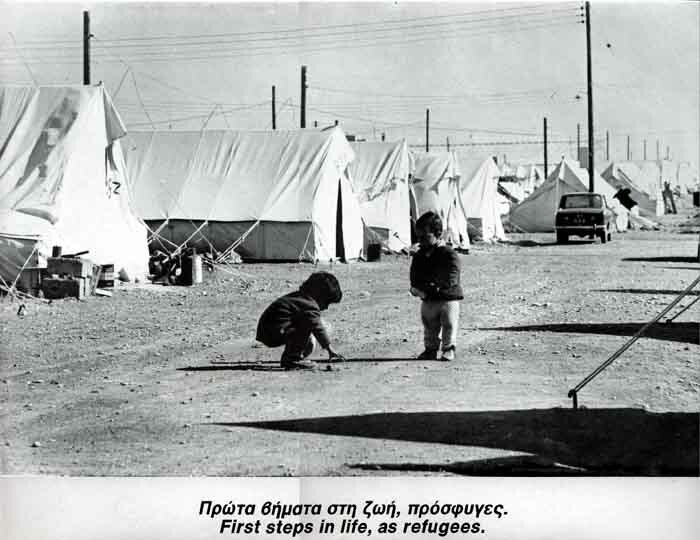 First steps in life as refugees. 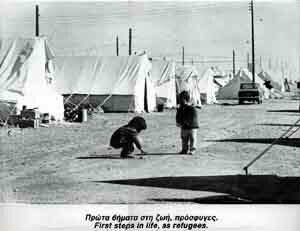 Young Greek Cypriot children playing inside the temporary refugee camps. 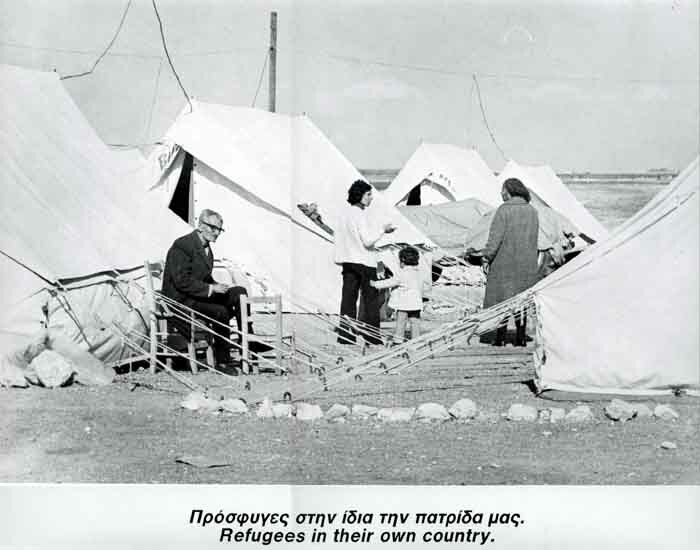 These refugee camps were set up immediately after the 1974 Turkish invasion to relief a great number of Greek Cypriot refugees which totals 200,000 and comprise 1/3 of the total population of Cyprus. 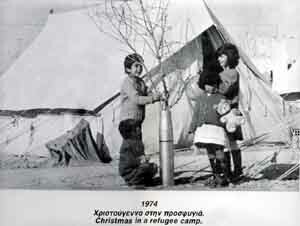 Since 1974, no refugee has been permitted to return back to his/her home despite the International outcry, the countless UN resolutions (that ask the immediate withdrawal of all Turkish Troops and the immediate return of ALL refugees back to their homes), and the decisions of the European Court of Human Rights (ECHR) that convicted Turkey for violating these rights to Greek-Cypriots, lawful owners and inhabitants in the occupied part of Cyprus. 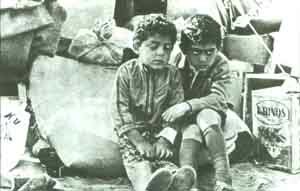 The violent expatriation from the natural homeland, caused a lot both materialistic as well as psychologically, especially for the young Greek Cypriot children. In the photo on the right, two Greek Cypriot children are sitting amongst bags of supplies, foods, and olive oil containers! The fear, and desperation is more than obvious and shown on their faces as a result of the Turkish invasion and occupation, that forced them violently, to become refugees overnight. Greek Cypriot refugees in their own country. Based on comparison figures, in a case of a similar disaster, the United States of America would have lost 40% of their territory, they would have had 120,000,000 refugees ethnically cleansed from 40% of the country and consequently dispose them on the remaining 60% of the country overnight. There would have been one million missing persons, 3,600,000 dead and a loss of 60% of natural and economic resources. Moreover, the capital Washington D.C., as well as Boston Massachusetts would have been divided (the case of capital Nicosia), and finally San Francisco would have been evacuated during the invasion, ending up to be a ghost town (The case of Famagusta). Can you imagine the atrocious consequences the 1974 Turkish invasion had on Cyprus? For more information, Click HERE. These Greek Cypriot children continue to play without fully understanding and appreciating the terrible consequences of the 1974 Turkish invasion. As time passes by, these bitter memories for the terrible injustice would poison the innocence of their young souls. In the photo, the children are setting and decorating the Christmas Tree for Christmas 1974 using a dry branch of a tree and an artillery empty shell. For more information regarding the Cyprus problem, Click HERE. Classes carried out inside refugee camps tents. 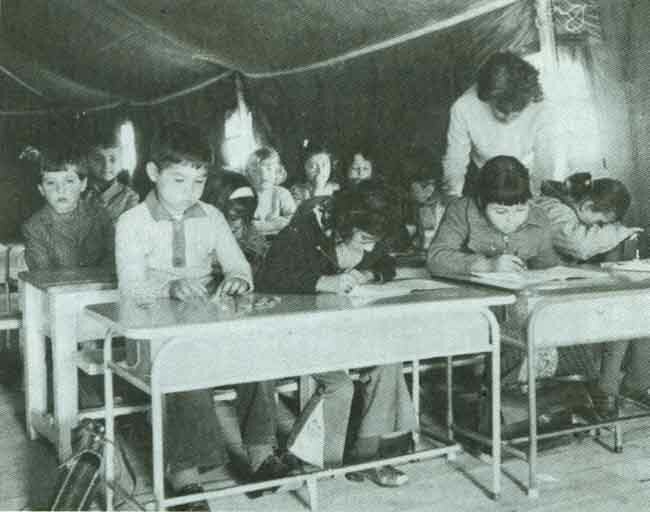 As a result of the Turkish invasion and occupation of 37% of Cyprus by Turkish military forces, Cyprus lost more than 100 Greek Elementary and High Schools. 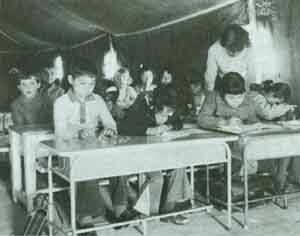 Greek-Cypriot students were forced to attend classes inside refugee camps tents for the school year 1974-1975, and even 1975-1976 that were set up specifically for this reason. The conditions were harsh since there was not adequate lighting, neither heating. Still, life had to go on with all means available.